Nestled in the heart of the Hautes Cotes de Beaune appellation, this domaine is located in Nantoux, a small village next to Beaune, and of course the villages of Pommard, Meursault, Monthelie, and Volnay. Parallel to the cote de Beaune, protected from wind by the hills of the Côte – d’Or on steep slopes, the vineyards of the Hautes Cotes de Beaune Appelation enjoy a healthy microclimate; sunny and bright. The vines habitat the best, warmest exposition, on these very steep slopes. It is here that the vines thrive in the shallow and nourishing clay-limestone soil; ideal for developing the flavors of the noble pinot noir grape. 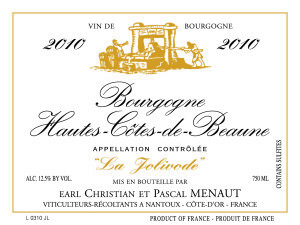 The Menaut family traces their roots in Nantoux back many generations. The “modern” history of quality really started with the creation of this Domaine by Christian Menaut who started working the land in 1962. In fact it is at the end of this year (2016) that Christian will finally retire after 54 years of hard work. For the past 6 years he has been training his son, Pascal, to take over the family domaine, and even though Christian is retired his presence looms large at this winery. Just a brief note about Christian. At Golden Vines, we often talk about finding tiny off the beaten path wineries making exceptional wines that have never been to the states before. This is a prefect example; although we can’t describe it as a diamond in the rough, because Burgundy is hardly the “rough,” the domaine is indeed a diamond. As we were tasting the great wines together, and noticed the quality we started talking and asking questions about Christian’s past. It turns out that he has been making wine for 54 years, that he is a commander in the order of the Confrérie des Chevaliers du Tastevin (an exclusive bacchanalian fraternity of Burgundy wine tasters with chapters around the world originally founded in 1703) and he tasted professionally for 30 years at “l’Institut Technique Viticole de Beaune” or the wine institute of Beaune as a comparative taster for the selection of clones. 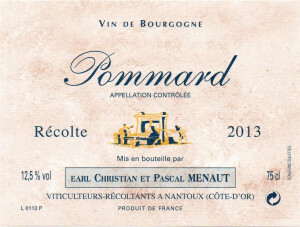 The impressive resumé makes sense as the domaine makes truly impressive, spot-on wines. The domaine owns 10 hectares and takes great pride in controlling every step in the process; from planting the seeds to working the vineyards all year round with the help of staff selected and trained by the winemaker, harvesting the grapes, and, of course, the entire wine-making process. The domaine never buys grapes, and never out-sources any of the winemaking of the vineyard husbandry. Respecting the vine is of primordial importance and yields are kept very low to not put too much strain on the vine and the earth the nourishes it.